Surging production that made 2018 a banner year for U.S. oil and natural gas is carrying into the new year, data show. Success in shale development across the country spurred natural gas production to hit a new record high in 2018 for the second consecutive year. Meanwhile, oil production continues to outpace 2018’s record highs and gives no indication of slowing. According to the Energy Information Administration’s latest data, U.S. natural gas production increased by 10.0 billion cubic feet per day (Bcf/d) last year. The increase, up 11 percent from 2017 withdrawal levels, was the largest annual production increase on record. Production measured as gross withdrawals averaged 101.3 Bcf/d – the highest volume ever recorded. With the exception of June, gross withdrawals increased every month of the year, saving the best for last to close 2018 with the year’s monthly high of 107.8 Bcf/d in December. It was a benchmark year for Ohio, which produced 2.4 trillion cubic feet of natural gas – up from 1.7 Tcf in 2017 – the first time the state has produced more than 2 Tcf since shale development began. Pennsylvania, the No. 2 producing state with 6.1 Tcf of natural gas produced in 2018 (up from 5.4 Tcf produced in 2017), continues to close in on Texas, the top state for gas production, according to the Texas Independent Producers & Royalty Owners Association’s 2019 State of Energy Report. The Appalachian region’s position as the driving force of America’s natural gas industry will remain in place for decades to come, according to a new report from IHSMarkit. The study forecasts the basin will supply 45 percent of the nation’s gas production by 2040, while regional natural gas liquids production will nearly double, from 0.60 million barrels per day in 2018 to 1.17 million in 2040. As natural gas production continues to raise the bar seemingly as quickly as the EIA can set a new one, U.S. oil continues its rise. 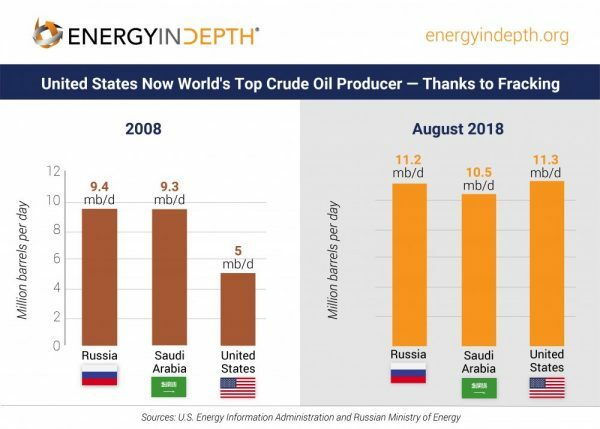 As EID noted in covering the record-shattering year for U.S. oil, it was only this past August when U.S. crude oil production exceeded 11 million b/d for the first time ever, more than doubling 2008 production. That figure also meant the United States surpassed Russia as the world’s largest crude oil producer for that time, according to the EIA. With an average of 10.9 million b/d in last year, oil production continued to climb as the calendar turned to 2019. According to the EIA’s Short-Term Energy Outlook, the estimates show U.S. crude oil production averaged 11.9 million b/d in January. In the week ending February 15, production would hit a record 12 million b/d. As highlighted by OilPrice, the EIA now forecasts U.S. crude oil production will average 12.4 million bp/d this year and 13.2 million next year, with most of the growth coming from the Permian, as would be expected given the play’s output last year. Indeed, as she noted, the state’s daily crude oil production accumulated the lion’s share of growth in U.S. overall production, producing a state record 4.5 million b/d. This bodes well for the state’s workforce. According to the Texas Oil & Gas Association, the industry employed more than 348,000 Texans in 2018. Adding to the Permian’s output was a record production year from New Mexico. In 2017, the state produced nearly 173 million barrels. A year later, the state produced 246 million barrels – an increase of 42 percent. The increase in production netted the state about $2.2 billion in oil and gas taxes for the 2018 fiscal year, adding about $1 billion to the state’s education funding.